The Planck satellite, scheduled to be launched by the European Space Agency (ESA) in 2007 or 2008, will study the structure of the universe, measuring its most ancient radiation, the Cosmic Microwave Background (CMB), with an unprecedented accuracy. Called the ESA's“Time Machine,” Planck will look back to the dawn of time to analyze the CMB and determine how clusters of galaxies and individual galaxies were formed, helping astronomers decide which theories on the birth and evolution of the universe are correct. 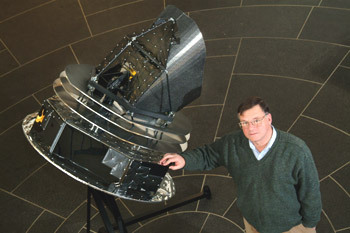 Partridge, a current member of the U.S. Planck team, was one of a dozen scientists who proposed this mission to the ESA 13 years ago.“Originally the team proposed two different satellites,” says Partridge,“before we decided to merge the high frequency and low frequency experiments.” At first, ESA agreed to provide funding for a more detailed study; nine years ago, the agency fully accepted the proposal and began planning and building the satellite, which was named for the German scientist who first described heat radiation. The Planck mission is a true example of international collaboration. The two project leaders are from Bologna, Italy, and Paris, France, and scientists from the United States, England, Spain, France, Finland, Denmark, Italy, Germany, Canada, and Norway are part of the team. The U.S. Planck efforts are supported by NASA, which also funded the Haverford model in the KINSC. When Planck is launched, it will accompany a second satellite aboard the Ariane 5, the newest and largest European rocket. Planck will be injected into a transfer trajectory and, after four months, will reach its final orbit at a point called“L2,” 1.5 million kilometers away from the Earth. This is far enough away to avoid heat emissions from the Earth, the moon, and the sun, which would interfere with measurements. Facing away from the sun, Planck will be in orbit for at least 18 months and will rotate once a minute. By the close of a year, it will have swept the entire sky twice.“It will take photographs of the distribution of matter in the early universe with the clarity of the highest-resolution digital camera,” says Partridge. Because the CMB is the first light to exist freely in the universe, observing it today gives astronomers an idea of how the universe appeared only 300,000 years after the Big Bang. Planck“photographs” the early universe by measuring its temperature. Scientists have previously observed slightly hotter or colder“patches” in the skyâ€”imprints left in the CMB by the“seeds” of today's huge concentrations of matter (like galaxies and galaxy clusters). Planck will image the pattern formed by these slightly hotter or colder regions. It will do so via a telescope, which will use mirrors to focus radiation from the sky onto two sets of highly sensitive detectors, one called the Low Frequency Instrument (LFI) and the other the High Frequency Instrument (HFI). The LFI's radio receivers will operate in a manner similar to transistor radios, amplifying the signal collected by the telescope; this signal is then converted to a voltage and stored in a computer for future analysis. The HFI detects microwave“light” using tiny thermometers, with the light focused on them by small gold-plated horns. Each of the dozens of receivers measures the temperature of a slightly different part of the sky. All are housed in a refrigerated unit covered with gold foil to keep it cool. Cooling vanes encircle the body of the satellite, keeping heat away from the mirrors so the temperature of Planck's inner region won't reach higher than 45 degrees above absolute zero (minus 377 degrees Fahrenheit). Partridge's students, including Ryan Sajac '06, have been instrumental to his research efforts. Sajac designed a computer program depicting a map of the sky, taking information from the earlier WMAP project to plot all the sources of radiation.“I randomly inserted a specific number of sourcesâ€”ones that WMAP could not detectâ€”onto my map,” he says.“These sources should be measurable by Planck.” The main purpose of Sajac's map is to reproduce these inserted sourcesâ€”called foreground emissionsâ€”so they can be subtracted from the reading of the Planck pictures, leaving only background radiation from the Big Bang. Ultimately, Partridge and his fellow scientists hope that Planck's photographs will answer some pressing questions: How did the universe begin? What are its present large-scale properties? Is its geometry flat or curved? How fast is it expanding? How are its structures formed? Observing polarizations in the pattern of the hot and cold patches will allow Planck to answer questions about the Big Bang itself.